Learning is part of the culture at ImagineSoftware. Training programs help employees show greater productivity, higher morale and higher quality of work. Employees are more confident in their roles. Certification programs for various levels are now offered to new and existing clients. Certification programs are held at the ImagineSoftware Headquarters in Charlotte, NC. The training is provided classroom style with an instructor and a required online exam to complete the course. The duration is 3-5 days based on the program selected. Results are certified, trained individuals (with badges to prove it), to improve your organization with learned skills. Certification fees range from $495 - $4,995 and include classroom training, materials, exam fees, daily lunch, snacks and beverages. 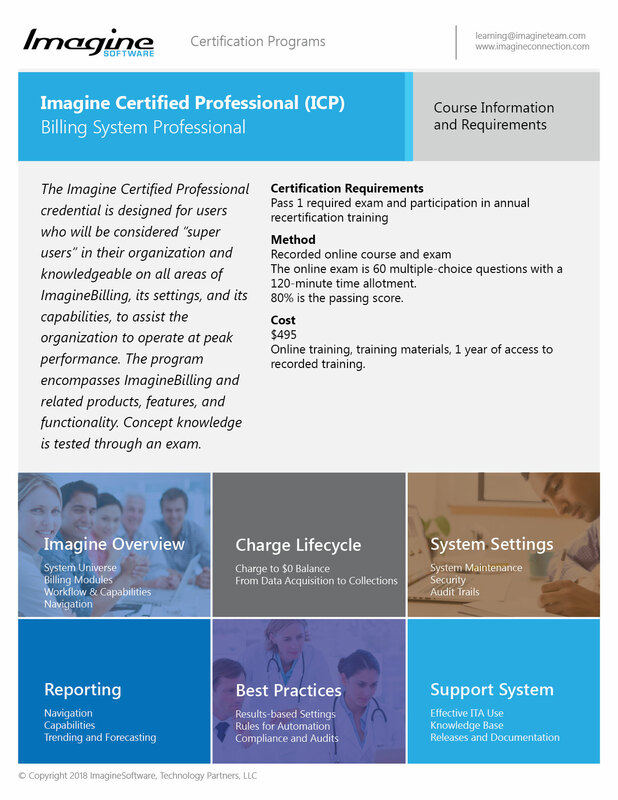 The ICP credential is designed for users identified by the billing manager or administrator who will be considered "super users" in their organization and knowledgeable in all areas of ImagineBilling. The course encompasses ImagineBilling, features and functionality. The ICEE credential is designed for billing office managers and billing office administrators. The course encompasses ImagineBilling, related products, reports and dashboards. This certification provides direct access to Level 2 support. ** Please note that ICP is a prerequisite to ICEE. You must complete the ICP course before registering for this course. The ICDP credential is designed for clients and partners that request database access. This certification is now required for database access. The course encompasses ImagineBilling, interfaces, SQL, Appliance, System Maintenance, i3 and other components. ** Please note that ICP is a prerequisite to ICDP. You must complete the ICP course before registering for this course. 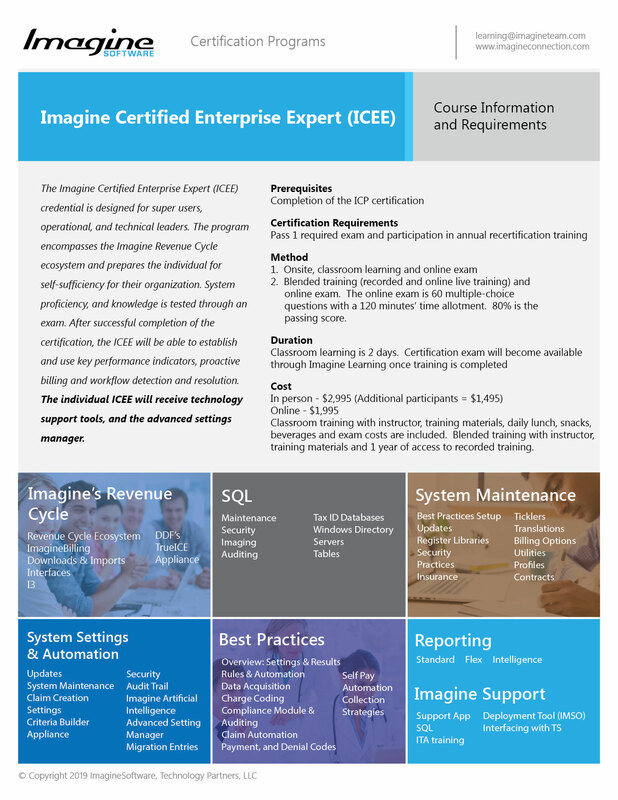 The ICIE credential is designed for executives and Imagine client staff with SQL understanding. The course encompasses all ImagineBilling reporting methods, including the types of reports, build methods, design, settings and creations. ** Please note that ICP is a prerequisite to ICIE. You must complete the ICP course before registering for this course.